New Delhi, 18 July 2017: Medical Council of India (MCI) with the prior approval of the Union Government has notified the amendment in Clause 1.5 of Indian Medical Council (Professional Conduct, Etiquette and Ethics) Regulations, 2002, vide notification dated 21.09.2016, which now prescribes “Every physician should prescribe drugs with generic names legibly and preferably in capital letters and he/she shall ensure that there is a rational prescription and use of drugs”. MCI has issued a Circular on 21.04.2017 vide which all the Registered Medical Practitioners under the Indian Medical Council (IMC) Act have been directed to comply with the aforesaid provisions. The State Medical Councils and MCI are empowered under the Ethics Code to take action against such doctors. 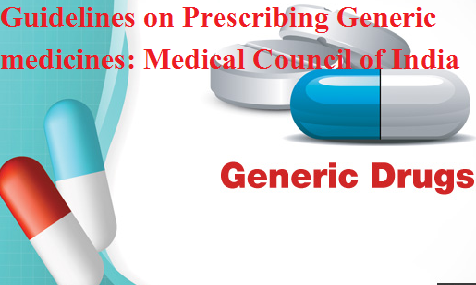 Indian Medical Council (Professional Conduct, Etiquette and Ethics) Regulations, 2002, vide notification dated 21.09.2016, which now prescribes “Every physician should prescribe drugs with generic names legibly and preferably in capital letters and he/she shall ensure that there is a rational prescription and use of drugs”.